When Irene lived in Rappstr. 3 again, air-raid warnings often forced her and her foster mother into the shelter in the cellar. Her foster father stayed on his own in the apartment. Irene thought him very brave for this. Once, a bomb hit the neighbouring house, knocked off the balcony and landed in the courtyard. The house rose and fell, everything shook, the earth moved and they where engulfed by a cloud of dust. Everyone feared that the house would collapse on top of them, but the walls held. After this her foster mother always took Irene to the air-raid shelter in Bornplatz when the sirens went off. Jews were not allowed in the shelter! This was where it proved useful that she was now called Reni Proskauer. No one would imagine that she was only the foster child and Jewish. One night, Irene, who had slept through the air-raid sirens, was woken up, and had to dress in such a hurry that she did not have time to tie her shoes. Everyone frantically rushed downstairs and she lost her shoes on the way. Even her foster father, who often did not even get up when there was an alarm, grabbed Irene by the hand and tore out of the house. Outside, he sat her on his shoulders. It was very hot and people were rushing about in panic. There was no way through. Either fire or rubble blocked their path. The foster parents wanted to get to the shelter in Bornplatz. They made it after a number of detours. Her foster father ran back to the house again. They had just experienced the opening phase of "Operation Gomorrha". After the raid they went back home, but two days later there was another air-raid warning. "Sunday, 25th July 1943, 1 am: Start of 'Operation Gomorrha'. For hours, wave after wave, 600 British planes dropped incendiary and high-explosive bombs, primarily on the Hoheluft, Altona, Eimsbüttel and the inner city districts. 1,500 people died, as many as in all 137 raids which the city had experienced since the outbreak of war. But this was only the beginning of the inferno which broke out over Hamburg two days later. In the night between Tuesday and Wednesday, 27th/28th July 1943, 800 British planes attacked Harnburg from all sides. Within half an hour, the districts of Rothenburgsort, Hammerbrook, Hohenfelde, Borgfelde, Hamm, Eilbek and parts of Barmbek and Wandsbek were turned into a sea of flames. Between 35 and 40 thousand people died in this night alone . . . In the hours that followed, 900,000 people, more than half the city's population, fled." [Die Zeit, No.32, 31st July 1992, Operation Gomorrha, page 62]. The foster mother could not leave the shelter with the child for days because the raids continued. They kept going out of the shelter to see what was happening. Then one day she, and other women from the shelter, got onto an open lorry in front of the shelter. After an adventurous journey, they changed onto a train. Everyone in the compartment was very quiet. At the window, an old woman sat as though she was sleeping - she had died. Her foster mother said to Irene, "It's your birthday today!" So it was the 6th August 1943. Irene was very proud to be six years old. It is understandable why Frau Proskauer left Harnburg on this particular day. As of 6th August, at the age of six, Irene would have had to wear the "Star" and have born all the consequences. As it was, they were able to leave Hamburg unnoticed. 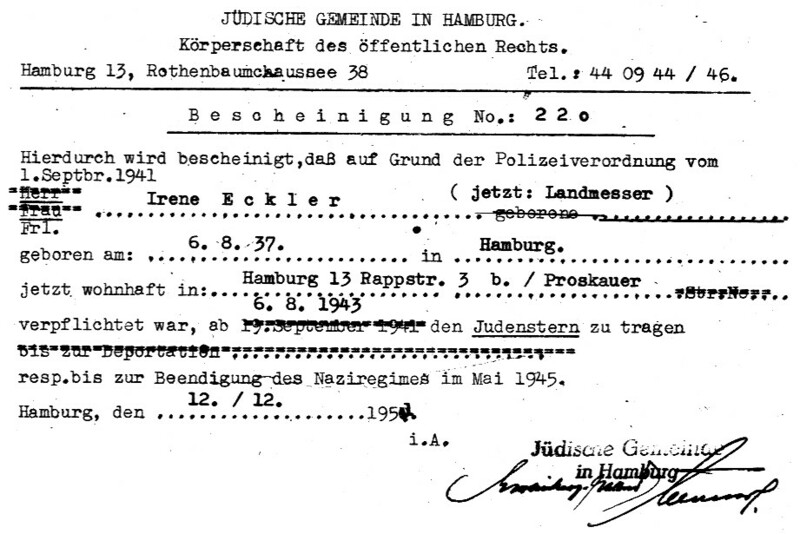 Police directive of st September 1941. Jews ... who have reached the age of six years are forbidden to appear in public without wearing the 'Star of David'." The foster father searched for them. He only found his wife's deserted bike leaning outside the shelter. They had disappeared without trace. They stayed in Calvörde in Brandenburg until the end of the war when they returned to Hamburg. The unselfish efforts of the Proskauers and of Ms. Schneemann during the war were admirable. But after the war Irene had no sense of gratitude. She would rather have perished with her own mother. The Jewish Community ceritified in 1951 that Irene was oblidged to wear the so-called "Jewish Star" ("Judenstern" / "Star of David") during the Nazi-period.